For my personal challenge Every month a kimono - February I put on the kimono that was on my dummy in January, the beautiful purple early Showa komon I bought from Ume Bloom. I tried to pair it with my purple-pink-silver fukuro obi and with my silver-birds fukuro obi, but somehow I really like the obi I'm wearing it with on the pictures. If you look closely, you can see that I've got 3 collars... The first layer is a tsuke-eri, because the second layer is my juban. This juban, a lovely red vintage juban, doesn't have an opening to put an erishin in... So what I tried to do is give the juban some 'grip'(?) with the tsuke-eri. What do you think of these 3 layers, is it okay or do you have an idea how to do this otherwise? 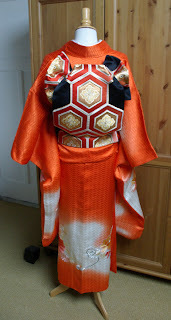 For my dummy I tried a different obi on my only furisode. 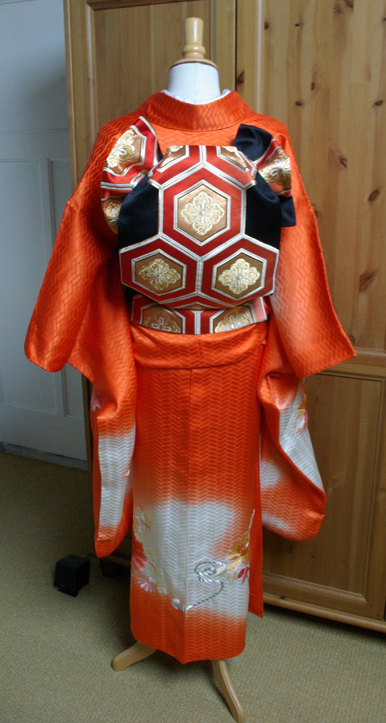 The only combination I've made with this furisode, is with the silver-birds fukuro obi. The obi I paired it with on my dummy has almost the same orange, but is very bold. Please don't look at how the obi is on the front! I've made the fukura suzume musubi with a biyousugata, but I calculated a tiny bit wrong. But main question... What do you think of the combo? Is this an option for Holland's Cherry Blossom Festival? prachtige die paarse komon, staat je erg mooi.